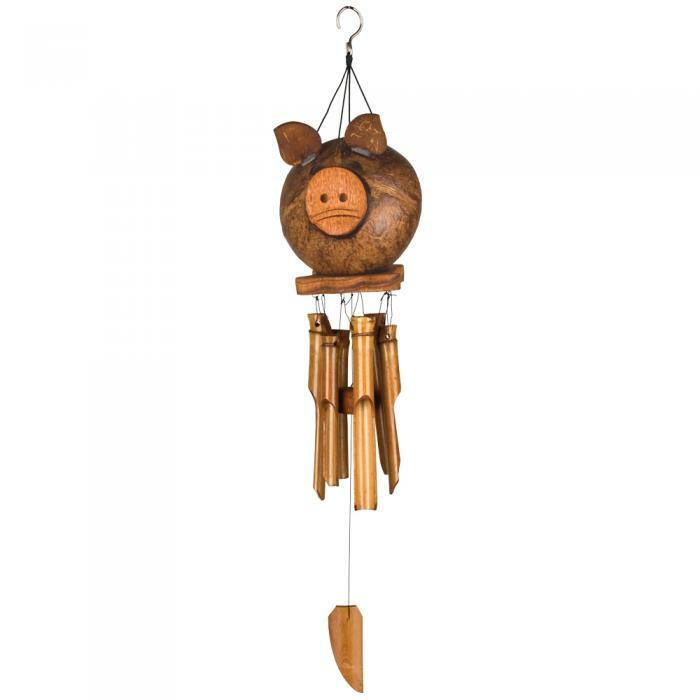 Give pigs a chance with this adorable coconut mellow sounding bamboo chime. Bamboo gives our Asli Arts wind chimes a mellow, musical and enchanting sound unlike any other windchime. Our chimes are made with pride by Balinese craftsmen. Each piece is individually hand-carved and handcrafted. Coconut and bamboo are used to make these instruments of nature. In addition, each chime is hand-toned by musicians. Testing the sound of each tube, our musician/craftsmen create chimes that sound as good as they look. By hand-toning each tube and selecting a range of sizes, they ensure that each chime will produce a unique melody. The cute coconut pig is perfect for collectors or anyone looking to enhance their environment. Swine not! •Hand-carved coconut pig, string tail, 6 bamboo tubes.